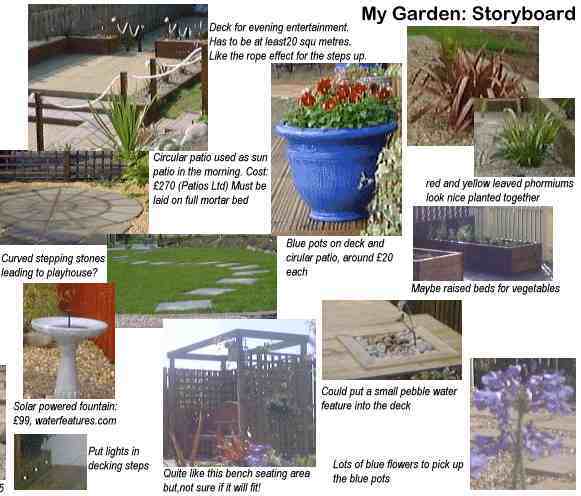 Before you actually start to draw any garden design, its important you do your research first and a good place to start is by compiling an ideas board. An ideas board is basically a scrapbook of ideas and design influences. Setting it all out on paper lets you see how the elements of your design will fit together. You can also get a good idea of what won't fit. Start by drawing up a wish list of all the things you want to appear on the final plan. From patios and flower beds to sheds and greenhouses, write down everything you might wish for. Then, using your list as a guide, look for good examples of all the elements you want. 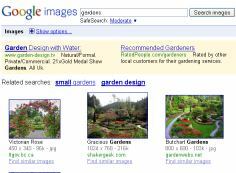 Gardening magazines, garden designer's websites and Google images are all great resources for you to use. Whether you prefer formal gardens or traditional cottage gardens, finding images of your preferred garden style will help you to get a good idea of what your eventual design will look like. 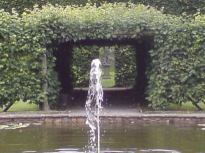 If you have already chosen a style for your garden, then you can look for features that fit with your design style. If you haven't been able to settle on a style, the ideas board will help you to do this. As you choose the features you like, print out an image of each one or cut the pictures out of gardening magazines until you have a pile of cuttings. For example, suppose you have a circular patio on your wishlist. You can choose from natural brick patios, those made from concrete blocks, precast concrete circular patio kits such as those sold by Marshalls or Bradstones, or natural stone. Maybe you want to use a stone cutter to make your own custom-built circle. You will find a picture of just the kind of thing you want somewhere and this will be included on your ideas board. When you finally have your pile of cuttings, look through them again with a critical eye and discard any you are not sure about. When you are happy with all the design elements, you are ready to put together your ideas board. Simply take a large piece of paper and glue your cuttings onto it. Beside the cuttings, write down any relevant notes and, if you have discovered a price, note it down beside the cutting too. Once completed, your ideas board probably looks great and there may be nothing you dislike about it but you should live with it for a few days before you make your final decision. Is there anything on your ideas board that seems to stand out because it doesn't fit in with your design style? Live with your ideas board for at least a week before you make your final decision. This is an important step. After all, you will have to live with your completed garden for a lot longer than that and you need to get it right. Finally, add all your estimated costs together to see if your design ideas fit in with your budget. If not, it's time to be ruthless. Cross the indulgent non-essentials off your wish list until you arrive at a budget you can afford. Alter the ideas board to suit. Drawing out a garden plan takes a great deal of time and there can be nothing more frustrating than having to rub out something you've painstakingly drawn to scale. A good, well-researched ideas board will help you to avoid mistakes from the start. Once you're entirely happy with the look of the ideas board and you have a budget to suit, you can go ahead and draw up your garden plan.